As I mentioned in my last granola post, I didn’t really eat granola prior to pastry school, where we made it on day 1. Since then, I’ve been hooked, and I like using granola as a low-risk vehicle for use-up-whatever-I-have-in-my-pantry convenience and hmmm-I-wonder-if-this-will-go-with-that curiosity. In the past when I’ve used pistachios in granola, the end product has at times swung too savory. However, pairing it with honey (as is common in desserts, like my honey/fig/pistachio bliss sundae or torrone) mellows it out and lends a more balanced granola. Plus, honey is the perfect sweetener to create the “glue” for chunky granola clusters. 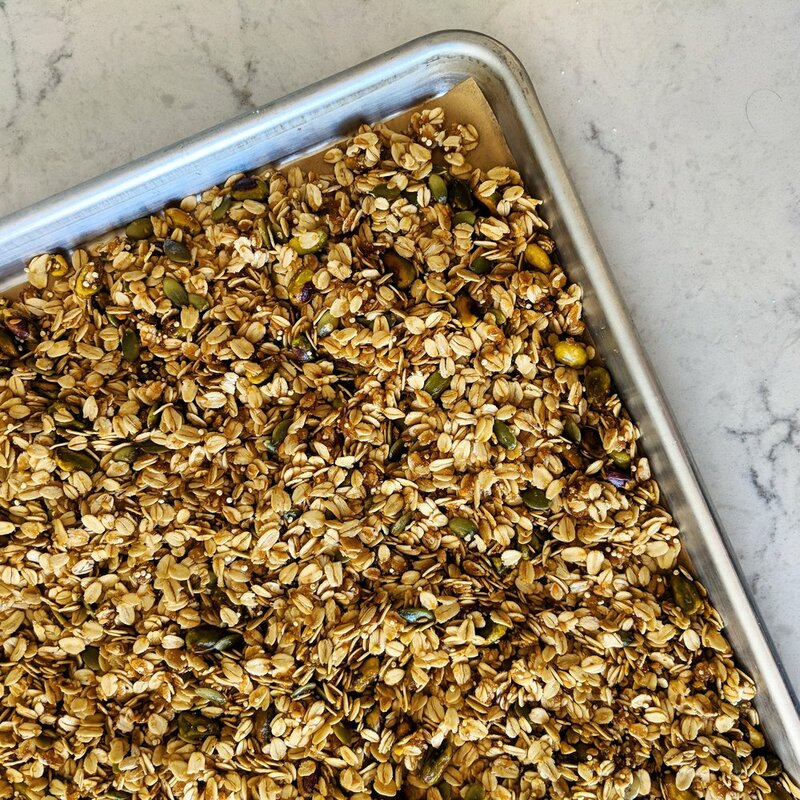 The “challenge” for this granola started as a way to use as many green items as possible: olive oil, pistachios, pumpkin seeds. I had also pulled out crystallized ginger and agave syrup (because agave plants are green), but changed course to a green + gold ingredient theme once I added honey as my main sweetener and threw golden flaxseed into the mix. 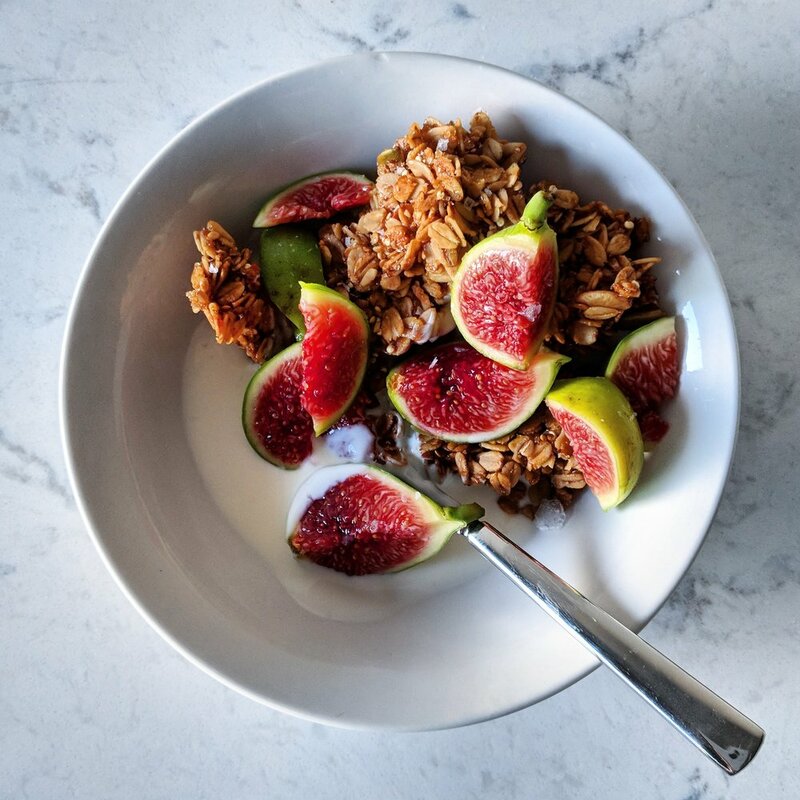 Granola should be easy and stress-free, so it’s not worth fretting over the lack of orange blossom water or flaky sea salt. Use this recipe as written or tweak it liberally to make it your own. Preheat oven to 300 degrees F (or nearest interval). If your oven runs hot or you have a convection oven, you might want to lower the temperature slightly. In a large mixing bowl, combine all your non-liquid ingredients and stir together. Stir in your liquid ingredients (oil, honey, orange blossom water) until combined. Dump granola mixture onto half sheet pan lined with parchment and spread evenly. Bake in oven for 30 - 35 minutes total, taking the pan out after 20 minutes to stir once and rotate your pan. Once out of the oven, push together granola so it forms solid rectangle and let cool on pan. Break up into clusters of desired size and store in airtight container. Top with yogurt and fresh fruit; drizzle with more honey if desired - to continue with the green/gold ingredient theme, I ate these with gorgeous green Adriatic figs from Good Eggs when I shot the granola but am also loving it with (green) grapes, too. Add in orange zest or slightly more orange blossom water to amp up the citrus notes, which are admittedly in the background right now. Add in dried fruit or a second nut. Swap out orange blossom water for rose water, and add freeze-dried or fresh raspberries. Cut some of the sweetness of the honey with a split of honey and agave syrup. For less-roasted pistachios, wait until halfway through the bake time to add them into mixture.